The Aleethia Foundation / Thank you, Phelps Family! 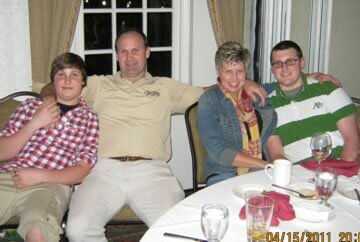 The Phelps Family attend the April 15th “Friday Night Dinner.” For the past five years Brian, Tracy, Carl and Eric of Jeannette, Pennsylvania have been devoted supporters of the Aleethia Foundation. They drive over four hours to spend an evening with our injured service members. The Aleethia Foundation greatly appreciates the Phelps Family continuous support of the injured service members and their families. We always look forward to their visit. Eric was kind enough to be our “volunteer photographer” for the evening and we thank him for his assistance. 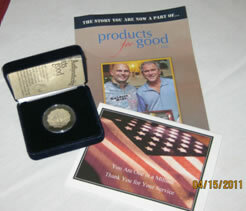 Also, Products for Good provided commemorative Iraqi coins that were distributed to thank the injured service members for their service and to let them know that their sacrifices will not be forgotten.